4/18/09: ok. so rebeca has a third sprout that i didn't know about. surprises of being a father, eh? also, we picked up andrew and filled underneath so he wouldn't get flooded. also, we cut down an overgrown bush/tree right outside my window. 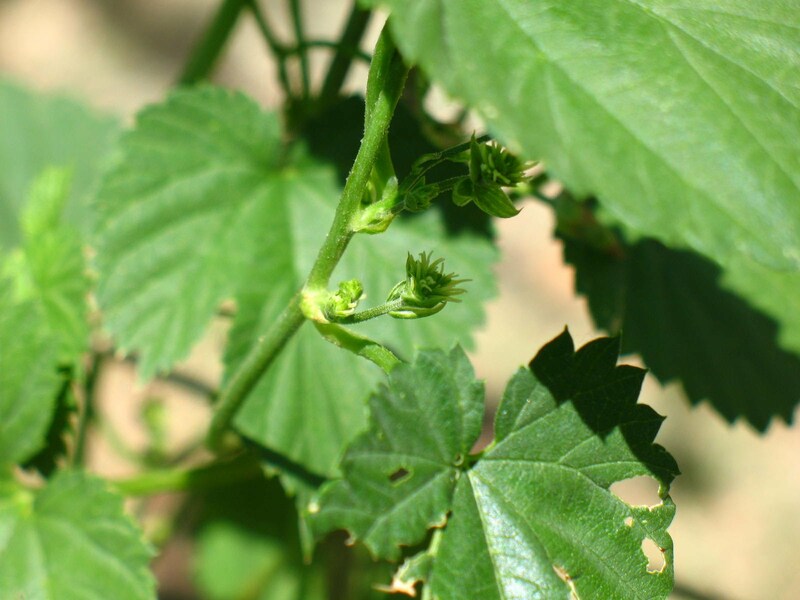 so now, not only do i have a better view of the hops from my room, they have more direct sunlght during the day. 4/17/09: so today is good too. rebeca has her own sprouts (yes, she has two)going, and andrew was growing one out the other end that i didn't even know about!very good stuff. 4/2/09: today is a glorious day. i have my first sprout!!! Jacob has his first sprout. rebeca is close (she has a tiny one, but it is not big enough to be considered a sprout yet.) very happy. was not able to get a good enough pic to post, so i will try again tomorrow. 3/15/09: the news is even better. yesterday, rebeca, jacob, and andrew arrived! it has been raining all weekend so i was unable to plant them, but i will as soon as i can. because we still have to clear out the vinca, i don't know how much longer i will have to wait to plant them. unfortunately, i don't have the holes ready yet either. oh well, the nutrients will just soak in directly. i am changing the pics from picasa to flickr, i find it easier to use, plus i don't use the picasa program anymore. check back for more pics of the new plants and news about what's happening next. 1/19/09: Today the news is good. i ordered my hops on 1/15/09 and they are expected to arrive later in late february or early march. also, i began pulling the evil vinca from the spot in which i plan to put the raised bed. the good news i got 80% done. the not so good news is that my parents said that i can't just pull the part i need to clear, i need to clear the whole area around it. the good news is that it took me an hour to clear appx. 20 sq. ft. of it, (i know because i set the dryer when i started and i went to put my tools away afterwards and i buzzed. i set ir for an hour.) and that was all on my own. i know my mom wants to get the vinca out of there anyways, so hopefully she will help me, hwich would turn the job into only one more afternoon. that's about all the news for now. Oh yeah, one more thing. i was reading and ops can be used as a sleep aid. take about 3-5 hops, crush them up, and put them into a tea and drink it about 25 minutes before you go to bed, and it wil help you get to sleep much faster. 12/30/08: I come to you today to keep those who read this page updated. in early february i will buy three hops rhizomes from The Thyme Garden and then dig my holes. hopefully, by the time i am ready, i will be able to dig in a raised bed right outside my window, so i can see them every morning. also, i hope i can set them up on a drip system with a timer this time rather than me having to turn it on manually. also, i recently found another blog called growinghopsyourself.com which you can access from the tab on the sidebar. other than that, that's it. keep tuned. 9/21/08: News is grave on this day. for the past two months i have been watering the hops in hopes of nursing them back to health. alas. it seems as though the only growth left on the stalk has died. i have pronounced sarah dead on 7/21/08. i will try again next year. report back in mid-march to learn of my new endeavors. as for now, it seems as though it was just not meant to be. 7/21/08: so i got the b12 (which is what everyone calls it, but on the packaging it's actually called Vitamin b1. weird, huh?) and used it. everyday when i water it, i am also throwing in coffe grounds. they are very rich in nutrients. i did that when i first dug the hole, and hopefully it will worka gain. i think it s because the buds are getting bigger (although too slow for my dad's opinion). new pics of leaf buds. check it out. 7/16/08: ok. so i performed a transplant and the hops are now in a planters pot. the best thing happened. i was out there looking at it and noticed a leaf bud. i was so happy. tomorrow i'm going down to ace and getting some b12 for it grow back nice and healthy. it's gonna survive. it really is. 7/9/08: not good news. so i get back, form my three week long vacation in oregon and washington and one of the first things i do is check out my hops. they're almost dead. all the leaves off them are dead, and most of the stems are brown. my dad watered them, although not as much a i would have liked. my mom's other plants are doing fine, so i'm pretty sure it's not the water. we haven't told our neighbor's about them yet, so i think that when they sprayed the vines that are weeds along the fence, they thought mine were weeds also and sprayed them. i'm not at all happy about it. gonna get some b12 and see if that'll work. if not, transplant (or new) for next year in a different location. (we were gonna move them there anyways. away from that fence and over to a brick wall. 6/9/08: so the original stalk that got bitten off, then regrew itself has now begun to branch off itself again (shown above). that's pretty sweet. so fer now, all three stalks are to the fence, and the tallest is stalk #2 which is appx. 2 ft high, with #1 not far behind it. they have been growing well, although my dad wants them to grow faster(i think he just wants to make the beer). anyways, i put a demonic looking cat sculpture that i made in ceramics out there to protect it from getting eaten again, and so far, it's working out pretty well. 5/29/08: this is so great. the sprout that got eaten off has regrown itself a new sprout!. now the other one is even with it and the smaller one is soon catching up. check out the pics, the new sprout on the original lead one is posted above. 5/17/08: well, the first thing is the really big stalk isn't doing that well. in fact, it's pretty much dead. the lead bud for the vine was eaten off by something, so it has pretty much stopped growing. the other two, who are doing awesome by the way, are growing over to the fence. we now have them on a sprinkler system, so that way it's easier. yeah. that's all that's new. 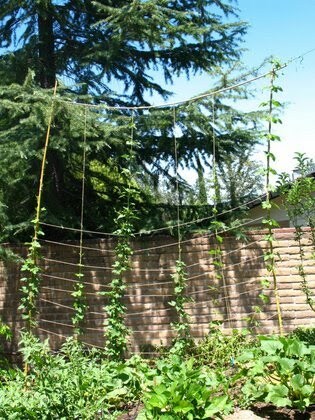 4/24/08: the hops have finally made their way to the fence, and have began to climb up them. unfortunately, there is something eating the leaves. we're gonna try and use organic methods to prevent this. as pic of it crawling up the fence is up in the pictures section. 4/18/08: Hey. new pics and news. first off, it's kinda hard to take pics now because the first stalk is growing so big. also, it seems that i have two new sprouts. look under the my pics to see them, but a pretty nice pic of the whole thing is above. 4/14/08: my second sprout now has two leaves on it. the original has about 5 or 6, and is about 5 inches tall. i am 60% sure i'm going to brew. i have also added a contact me link on the side, in case you have any questions. 4/10/08: I have another sprout!!! as you can see in the picture to the left, my original sprout has grown and already has a leaf. the new sprout is to the left of it. 4/1/08: hey. i just checked and it finally sprouted!!!! it's stalk isn't that long, but i've got a feeling it'll grow to be awesome. i am still deciding on wheather or not i will brew. i'll keep uploading pictures so keep tuned to see amazingness at work. 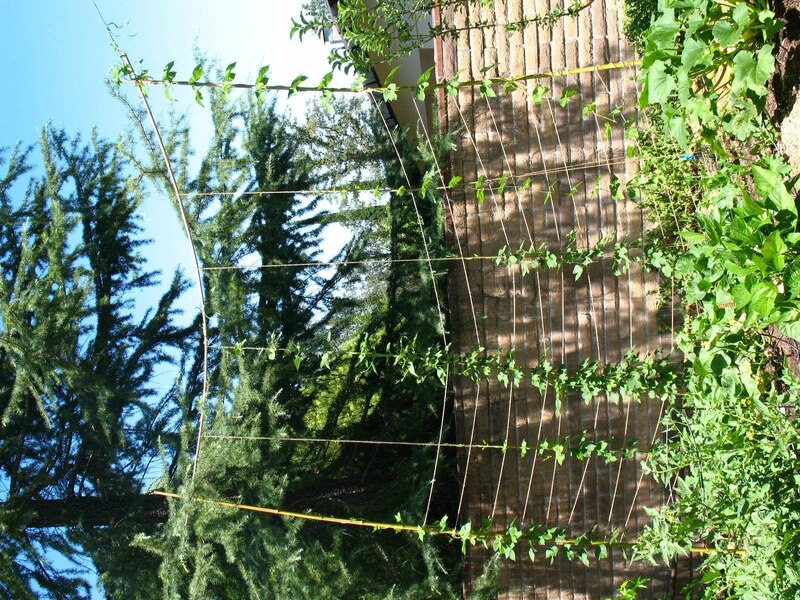 Grow Hops Yourself a great blog for those who are just starting out and want to grow hops.